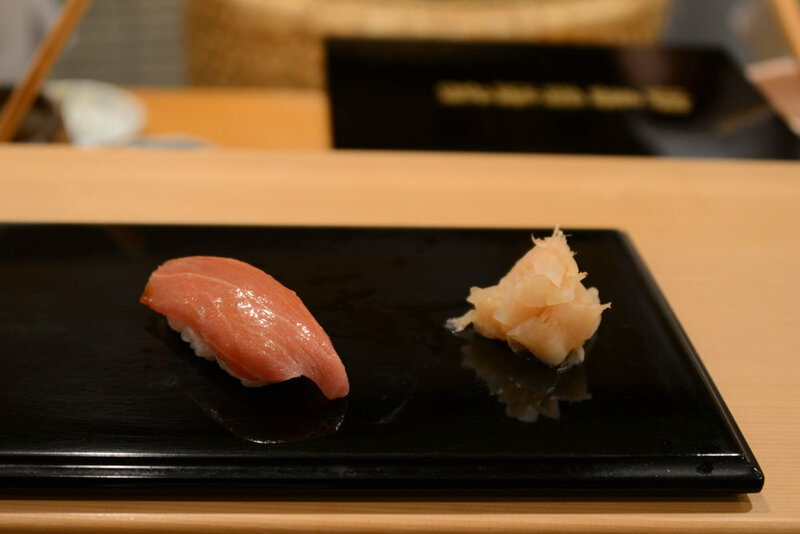 I guess no blog about food in Tokyo would be complete without writing about this celebrated sushi place. 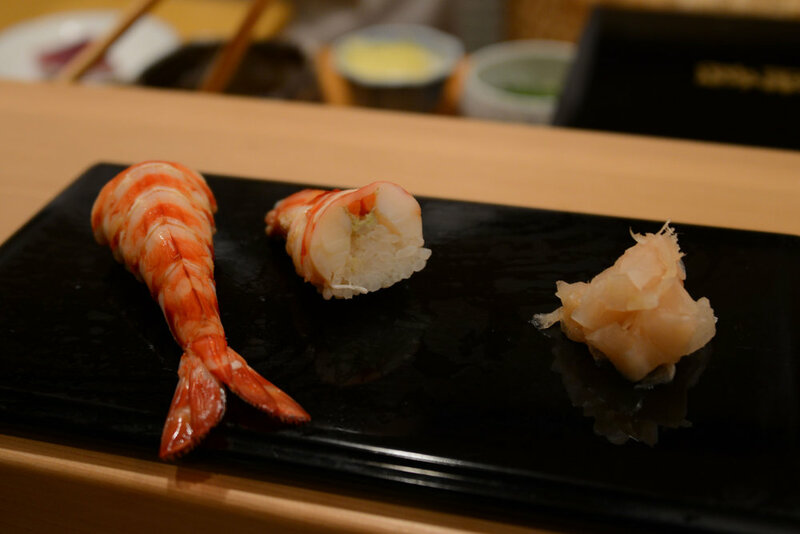 Ever since David Gelb’s documentary film “Jiro Dreams of Sushi ” was released in 2011, the hype of this Michelin 3 star establishment hit a global high resulting in more foreign visitors than local. A highly publicized visit from President Obama a few weeks ago only elevated it’s status making reservations slightly harder to come by. The Japanese don’t really revel in such attention. It is definitely not easy to make a reservation. If you are staying at a hotel without a direct link to the restaurant, don’t bother asking. Calling them is useless. They never pick up the phone. Rather, get someone to go there in person. 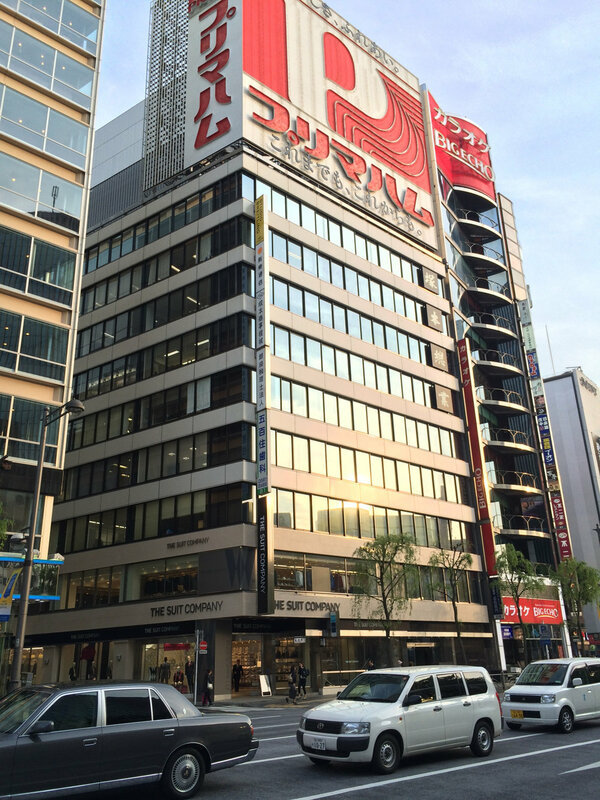 A 10.000 yen deposit per person is required to be made on the 1st day of every month for next month’s reservation. Come early to avoid being bumped. After they assign you a certain time and date for your reservation you will receive a piece of paper stating their rules. No shorts. No sandals. No T-shirts for male guests. No heavy makeup. No strong perfume. No taking pictures in front of the establishment. A rather strange set of rules but I guess if you are visiting someone’s home it would only polite to follow the rules of the host, no matter how strange. 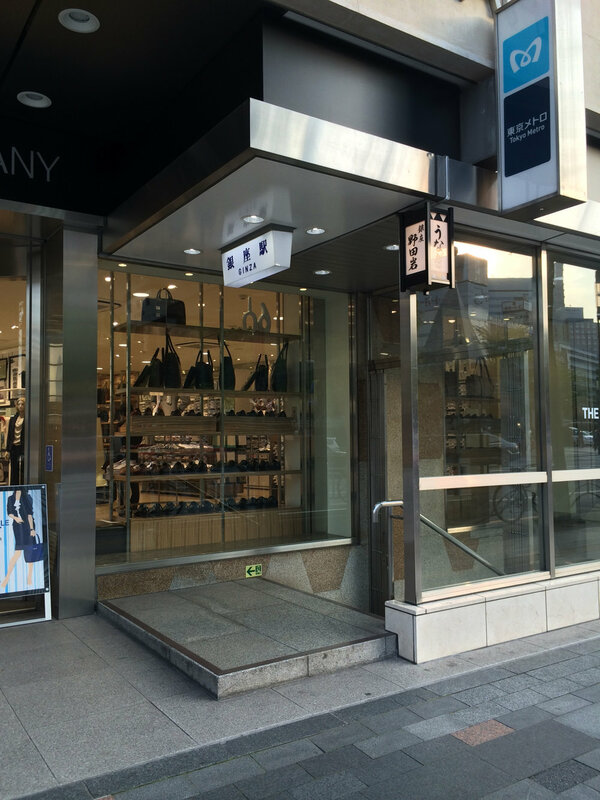 Sukiyabashi Jiro is located in the basement of an old building in Ginza. 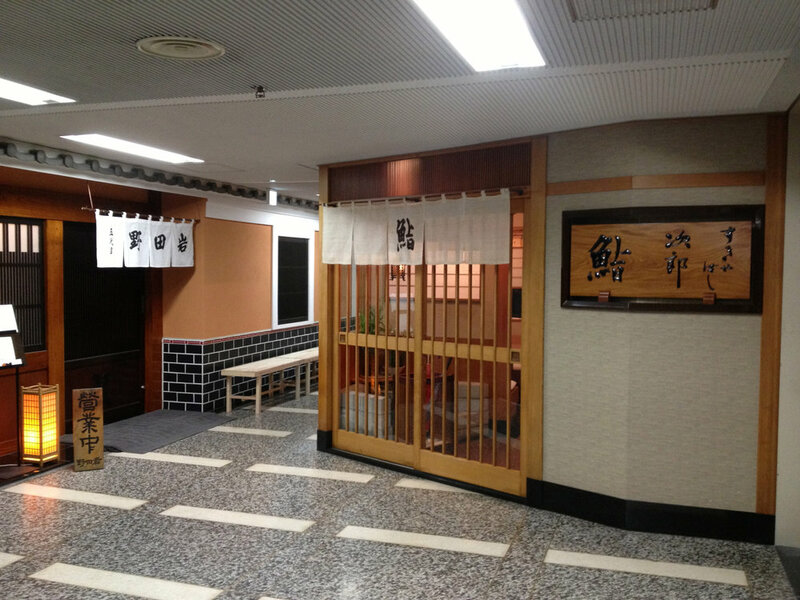 Even with all the International acclaim, Jiro’s location remains modest and unpretentious. I was lucky enough to visit the place with 2 friends and we were the only customers at the time. 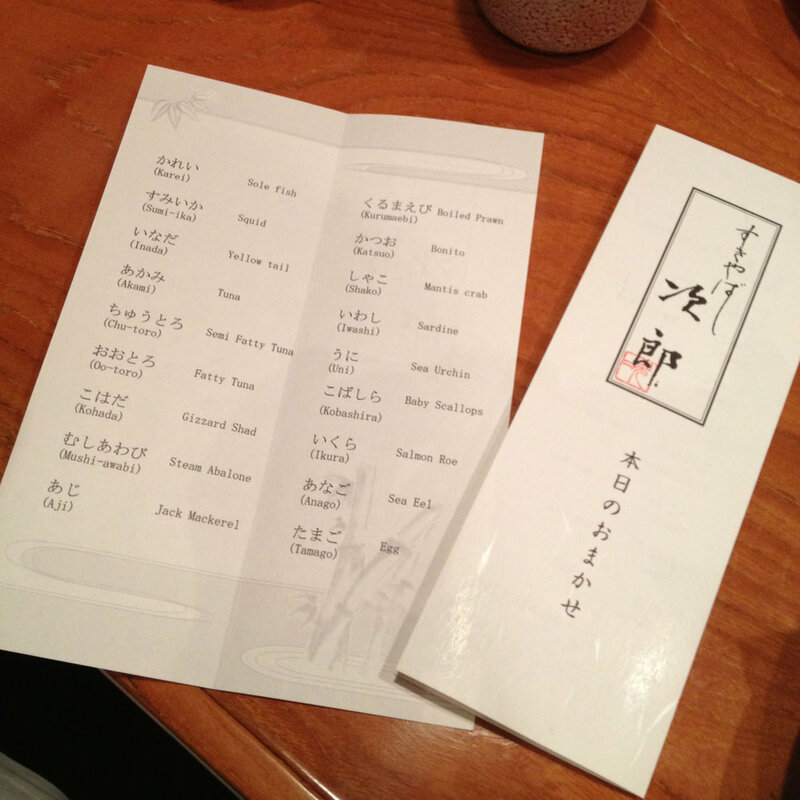 Below you will find a picture of the menu. A traditional sushi restaurant will normally serve food in this order. The first half is their fixed menu that stays the same all year round. The second half is their seasonal menu. I found it interesting that they did not have salmon sushi on their menu (only salmon roe). 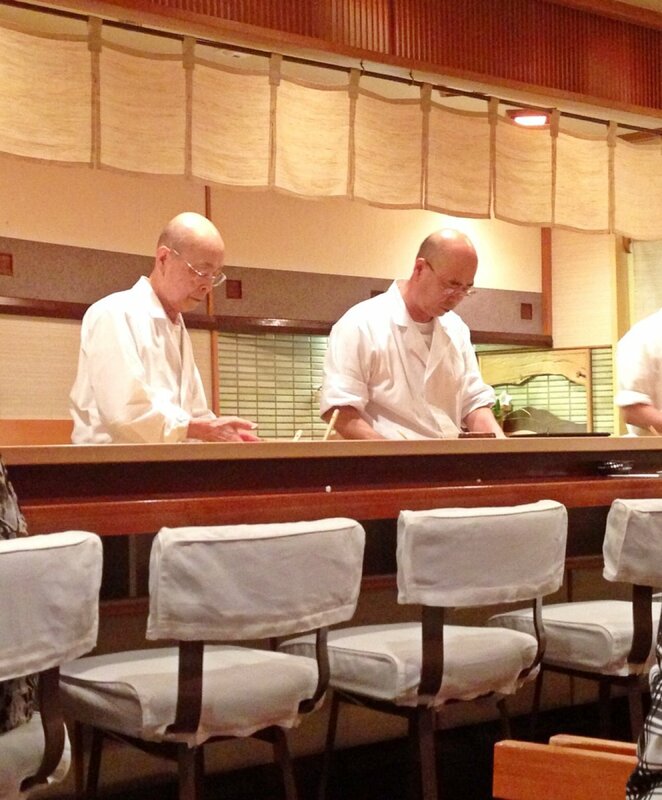 Chef Jiro himself explained to me that traditional sushi doesn’t serve salmon in their menu. 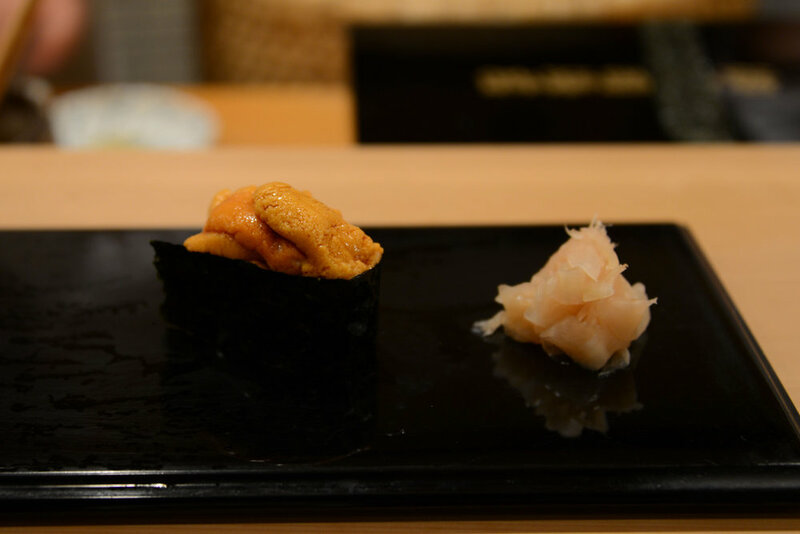 Traditional sushi menus mostly serve creatures of the sea. Salmon lives in both fresh and sea water. It was only later that salmon was added to sushi menus because the foreigners love it. Below is a picture of my yellow tail sushi . We were recommended to eat with our hands instead of using chopsticks. 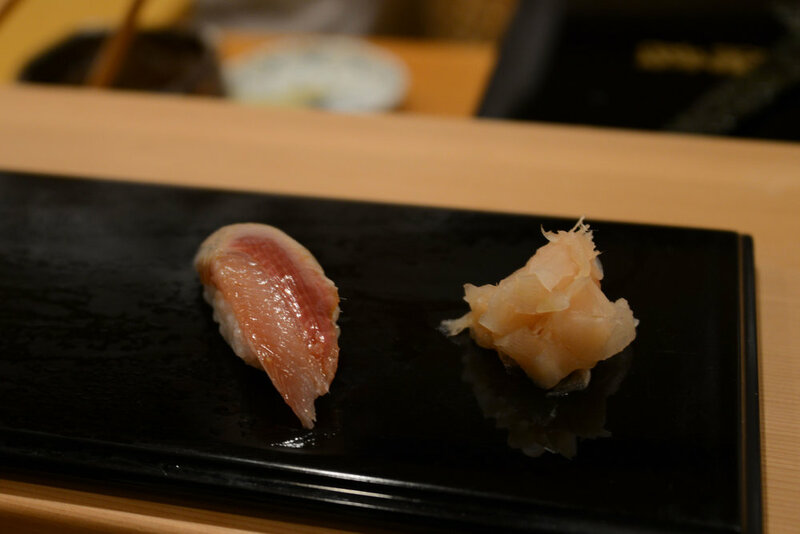 The semi fatty tuna below was also delicious. I noticed that after a few sushi pieces he would watch you closely as you devoured his creations, deciphering whether you are enjoying it or whether the sushi is the right bite size. About half way through I noticed Jiro scrutinizing us again. This time probably to see if we were struggling and whether or not to make the rice smaller to ensure we will be able to finish the entire course. When it was time for the sea urchin I wasn’t particularly thrilled since I’ve never really liked sea urchin. The smell always bothered me. This one however was exceptionally fresh that i actually enjoyed it. Last but not least was the Egg (Tamago) which was sweet and tasted more like a dessert. I am a big eater so the 18 course nigiri sushi wasn’t enough for me. I ended up ordering 2 more additional a la carte sushis costing about 2000 yen each. We were asked to move to a table for dessert as they prepared for another lunch. Dessert was a mouthwatering juicy melon with a cup of bitter Japanese tea to balance it out. All this will set you back about 30.000 yen per person but I have to say overall it was a wonderful experience. The sushi was fresh and delicious (one of the best sushis I’ve tried so far) and we were treated with the utmost respect and most gracious manners. I have heard complains from people who claimed they were treated in a snotty manner by this establishment. But I think as long as you respect their art which they take very seriously, they will respect you in return. Follow their rules and customs and you will have a lovely experience. My verdict is that they definitely live up to the hype. P.S : I did not hear the phone ring once during my lunch. Maybe there is no phone ?